Water moves in a wetting front. When irrigation water hits the soil it moves down with the pull of gravity and to the side according to the pull of soil particles (more lateral with more clay). Soil is a jumble of different sized soil particles, from clay to silt to sand sizes and then often intermixed with stones of different sizes from gravels to boulder. The different textures determine how water moves. It moves fastest through coarse textures and slowest through finer ones – the clays, the ones with the smallest pores. 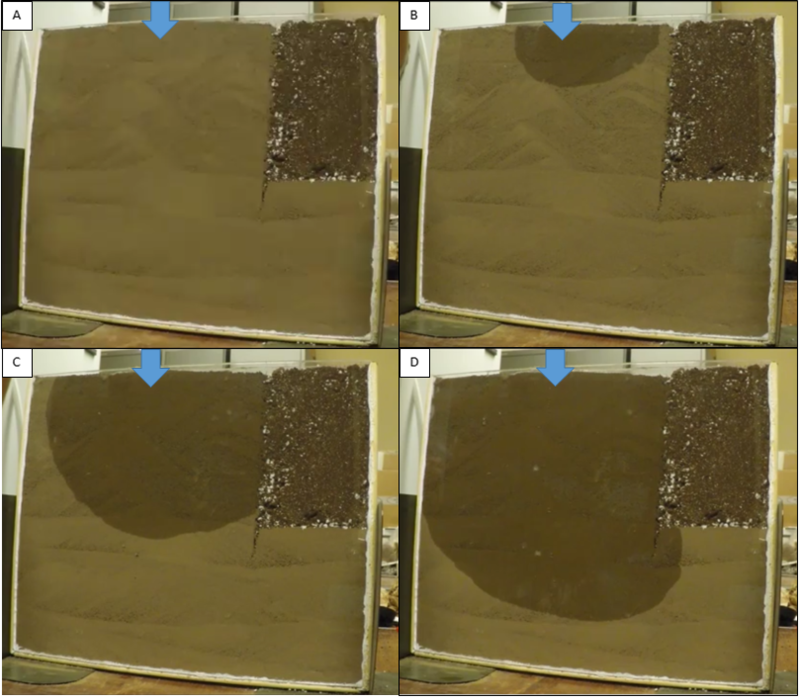 But soils are a jumble of particle sizes and pores. Water first moves down the larger pores and then it slowly moves through the larger ones. As water moves through the soil it carries salts that have accumulated in the soil. At the wetting front is where the salt accumulate. As the water moves through the larger pores, salts migrate/diffuse from the small pores to the larger ones. This diffusion takes a bit of time, so typically the small pores have a larger salt concentration than the larger ones. So an initial application of water will carry the salts from these large pores and if the irrigator were to stop in mid-application, it allows time for the salts to move out of the small pores into the larger ones. Then when the irrigation recommences, it will carry more of the salts out of the wetted area – the root zone. This technique is called “bumping” where an irrigation is stopped and then restarted in order to improve not only leaching, but also reduce runoff. This principle also is at play when there are two or more sources of water quality. Soil salinity can be no lower than the irrigation water that is applied. Then as the soil water is removed through plant absorption or evaporation, the salinity increases. 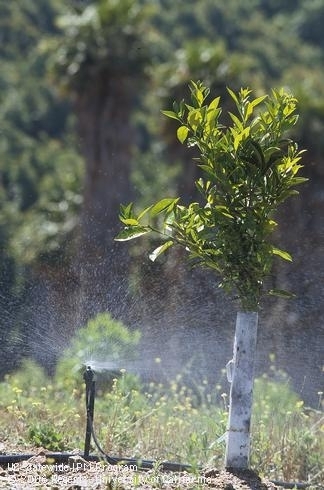 The soil salinity can easily be two to three times higher than the irrigation water. If there are two sources of water, the initial application can be with the poorer quality water, and once that has reduced the soil salinity, then the better water quality can be applied which will then bring the soil salinity closer to that of the better quality water. By doing this two part leaching, the amount applied of the better quality water can be significantly reduced. This is a type of “bumping” to improve leaching. 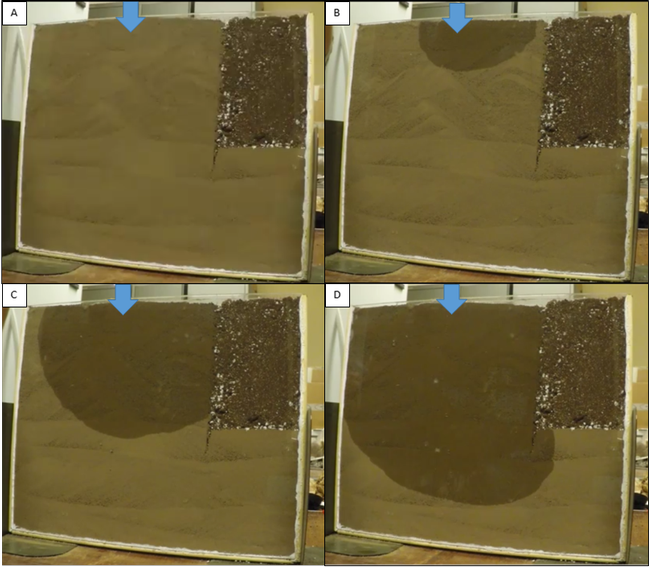 Watch this U-Tube video on how water moves through soil, thanks to the work at Walla Walla Community College.